Cynical and stuck up linguistics professor Henry Higgins works in London teaching the wealthy how to speak properly. 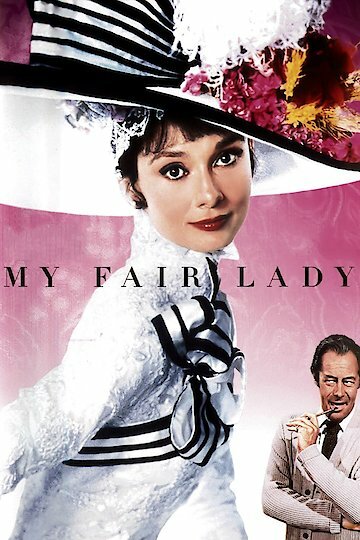 He makes a bet with a colleague that he can turn impoverished and unpolished guttersnipe Eliza Doolittle into a real lady after the flower seller comes to him seeking lessons. Her cockney accents make her difficult to understand and impedes her from reaching her goal of working in an actual flower shop. She can't afford the lessons from Higgins, who usually trains and works with the very rich, but Higgins' colleague offers to pay for the lessons and makes the bet. Higgins accepts and subjects Eliza to several speech exercises for many days to no avail. Higgins is strict and treats her badly, but Eliza endures. One day she has a sudden break through and understands, speaking perfectly. Higgins tries out her new accent at a horse race. The aristocrats present are impressed with her until she slips into her cockney accent. The ball is a success and Eliza charms many and even fools Karpathy, an old language student of Higgins' that he dislikes. Despite how well she is doing, Eliza has a fight with Higgins later and leaves him, upset that he is getting all the praise for her progress, that he treated her poorly and that he doesn't seem to care what will happen to her now that the bet is won. Eliza returns to her old home only and finds she no longer fits in. With nowhere else to turn she goes to Higgins' mother, who also becomes upset at the way her son has treated Eliza. When he comes to find her and apologize, Eliza gets her revenge on him by telling him that she plans to work with his enemy Karpathy and to marry an aristocrat before she leaves. Just as Higgins realizes he truly misses her, Eliza comes back to him.